A fun sculpture to play with, this sculpture features no-touch-required interactions that release balls onto the tracks at the wave of a hand. The sculpture remains in motion throughout the day, filling up three separate queue’s where the balls wait to be released. Any time a hand is waved in front of one of three sensors, a ball is released onto the track where it rolls on to a track element. The ball then jumps, bounces, or loops its way to the end. 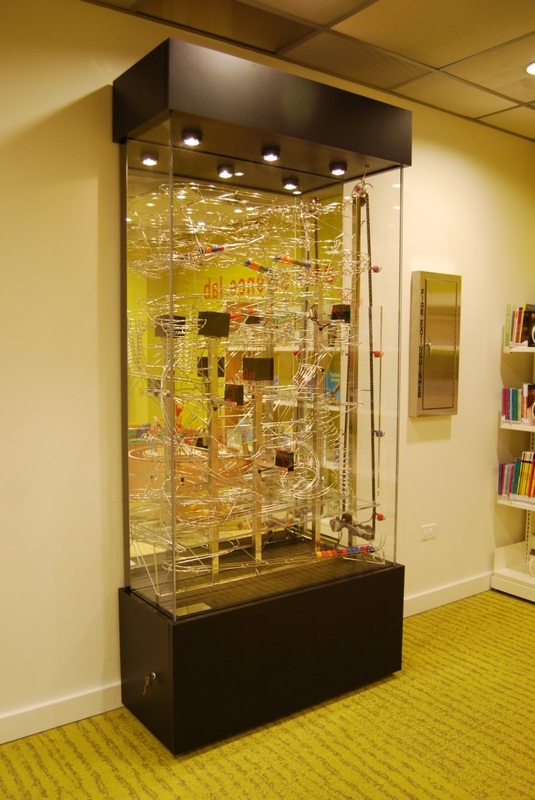 A laminated display case with acrylic sliding door, mirrored back-wall and interior lighting. An electric chain-lift in constant operation during open hours. Three no-touch interactions; balls release with a simple hand-wave. A double ball-bounce and a ball jump with interaction. Wave and Wonder has three no-touch interactions and a mirrored back panel inside the display case. Graphics encourage hand waving in front of the sensors that control the release of balls inside. The mirrored background reflects and multiplies the continuous ball motion of Wave and Wonder.